Sawtooth Oak is native of Eastern Asia. This Oak has small chestnut like leaves. It grows to about 50' which makes it one of the smaller Oaks. Sawtooth Oaks are an excellent food source for deer, elk, turkeys and other small animals. 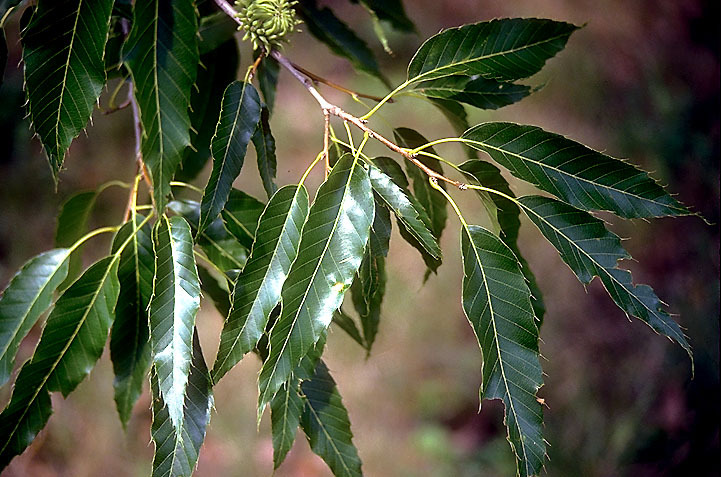 Nut production is higher in some years on Sawtooth Oaks than other Oaks. Hardy from zone 5-9. It is reported that the acorns take 2 years to develop. Sawtooth Oak prefers a well-drained, acid soil but will adapt to most soils except highly alkaline. Chlorosis develops on alkaline soils. Irrigation helps trees become established but once established, they grow very fast without irrigation. As it ages, it grows into a broad, rounded canopy that could make it useful as a shade tree, street or parking lot tree or a lawn tree specimen. Lower branches on Sawtooth Oaks need to be shortened then removed early when planting this as a street or parking lot tree since they will droop toward the ground as the tree grows older, requiring removal to allow for vehicular traffic. Leave the more upright, spreading branches to create more clearance beneath. Lower branches can be left on trees grown in more open areas to allow for full development of the picturesque, low branching, open form. Multi-trunked Sawtooth specimens can reportedly break up at about 25-years-old due to poor attachment so maintain the central leader. Leaf color runs from dark green in summer to yellow-brown in fall and hang on thru winter. The bark on a mature Sawtooth oak has deep ridges and furrows much like Chinese cork oak in appearance. We highly recommend tilling the soil before planting the Oaks to reduce weed competition. Our Oak seedlings and transplants are very easy to plant and on well worked soils with a 1 man gas powered auger with a 6" bit the job can be done very efficiently. These can be rented at most hardware stores. Prune to maintain a dominant leader by cutting back competing leaders. Do this every 3 years for the first 15-20 years after planting. We also have: Burr English Oak, English Oak, Willow Oak, Chestnut Oak, Columnar English Oak, Shumard Oak. White Oak, Swamp White Oak, Pin Oak, Northern Red Oak, Heritage Oak, Regal Prince Oak, Rocky Mountain White Oak, Oregon White Oak, Burr gambel Oak, Scarlet Oak, Northern Pin Oak, Bur Oak, Chinkapin Oak. To buy Sawtooth Oak seedlings and transplants use the link below. To order Sawtooth Oak by PHONE: We're glad to take your order by phone. For your convenience, we have a toll free number 800 568-9179. Phone orders can be charged to VISA or MasterCard accounts.